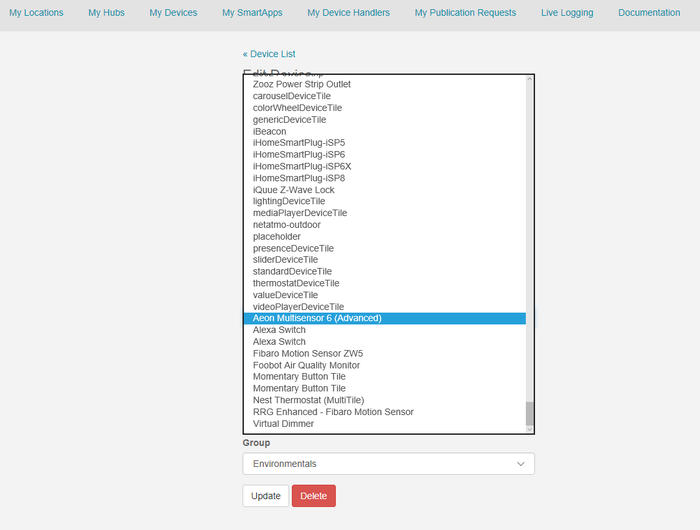 This will present you with a list of custom device types that you may have within your account. If you do not yet have the virtual dimmer listed, click the link +New Device Type in the upper right-hand corner of the screen. 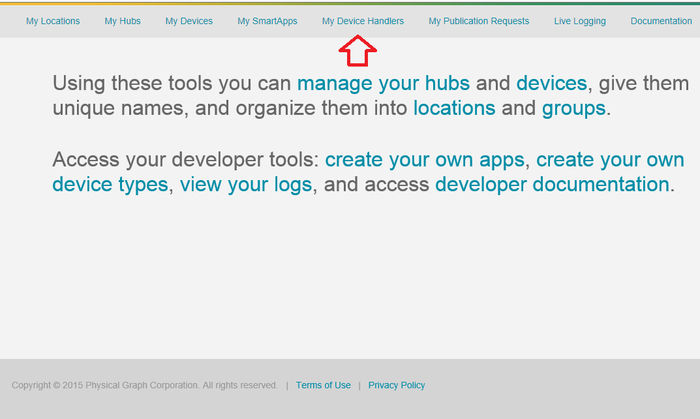 From here, you can add your device to SmartThings as normal. Typically, when SmartThings finds the device it tries the IDE code first to find a match to the devices. The Aeon MultiSensor 6 does have a default device handler, so if you integrate the device and you don't have this device handler activated (if it says (Advanced) after the title you have the correct device handler) , please proceed with the instructions. 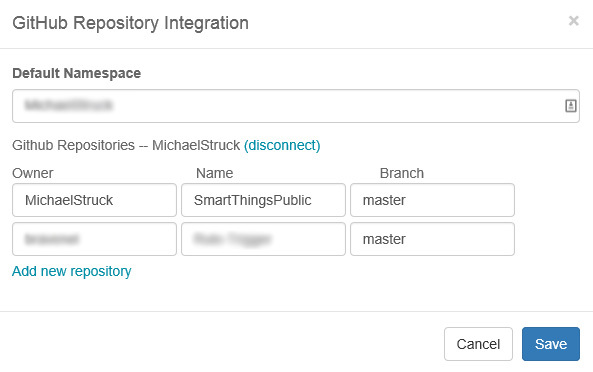 Once you have named the device and have it within SmartThings, find the device in the IDE under <<My Devices>>. 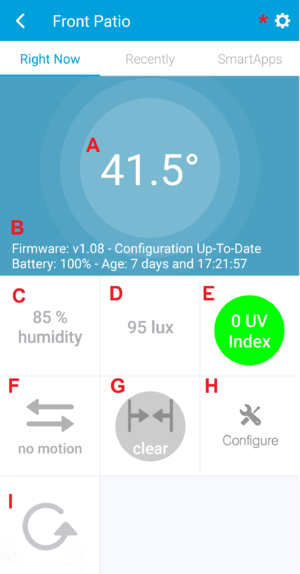 Once you find the device, click on the left-hand side to open up the properties. From there, go to the bottom and click <<Edit>>. 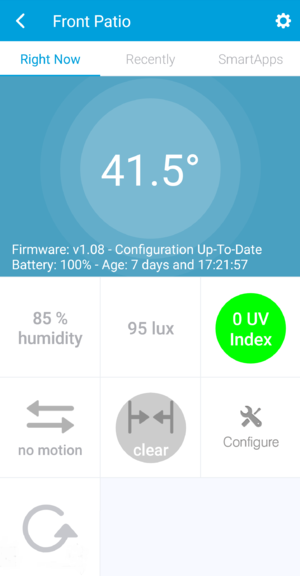 Finally, you should include this newly added device in an automation/application that can use temperature, humidity, motion, etc. There is a lot of useful information on the device screen. A Temperature This information is shown as the 'primary' information from this sensor in the SmartThings interface. The color of the background is based on the temperature displayed (cold = blue, hot = red). D Luminosity The value can be between 0 and 30,000 (with an offset available in the preferences) and is measured in 'lux'. F Motion Indicator This will become active when the device senses motion. Typically, the reading returns to normal with no motion and after the timeout you designate in the preferences. If you find the motion gets 'stuck' to on even when there is no motion, you can reset this by pressing the tamper indicator area in the middle of the interface. This will reset not only the motion but the vibration/tamper display as well. G Tamper Indicator This will become active when the device senses the device has motion. Typically, the reading returns to normal with no additional physical motion. If you find the tamper sensor gets 'stuck' even when the even when there is no motion, you can reset this by pressing the tamper indicator area in the middle of the interface. This will reset not only the vibration/tamper display but the motion (PIR) sensor as well. H Configuration When you change your preferences, many times new information will need to be uploaded to the device. A small orange dot will appear in the configuration button when an update is required. The update is automatic and will happen on the next device wake time. I Refresh This will refresh the data on the screen such as firmware and battery. It will NOT wake the device and refresh the environmental data. 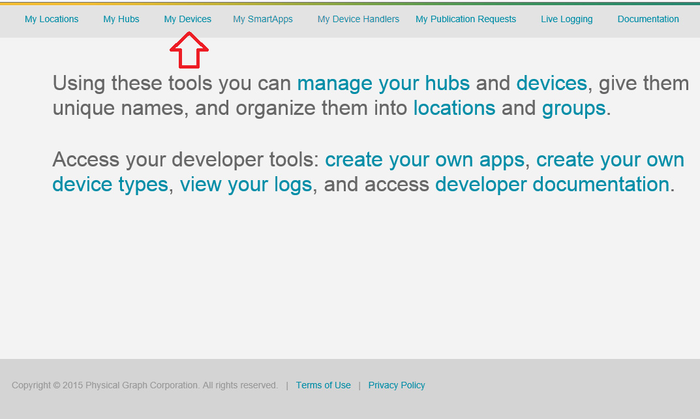 * Settings/Preferences This area will allow you to configure many of the setting of the device type handler. See below for the items you can configure. Battery or USB This setting determines the behavior of some aspects of the device and what is displayed on the main screen. It is assumed the device is on battery power unless otherwise stated. Disable LED This will disable the LED when reading motion. Only available with firmware version 1.08 and above. Please note that the LED will still light when the device is tampered with. Default is "On"
Stay Awake Time Sets the the device will remain awake when the device wakes up to report the various status. This only operated on firmware 1.08 and above. This may need to be increased to be able to send configuration data to the device before it goes back to sleep. Default is 30 seconds. This page was last edited on 30 June 2018, at 15:20.